If there is one collaboration last year that I was truly thankful for, it has got to be our 5-month partnership with FOX Kids & Baby. In fact, our patronage at FOX Kids & Baby started way back in 2005 when Ash was still a teeny weeny infant. And throughout the years, its clothes have proven to be not only well-designed and of good quality, but also provide value for money. So when FOX approached us for yet another collaboration, I could not find any reason to turn it down. After all, how can I say no to having a legitimate excuse to visit FOX Kids & Baby shops AND stock up on more clothes for the monkies? 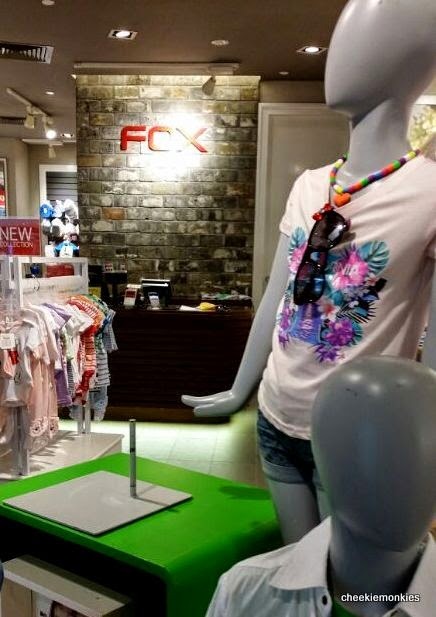 Because you just can't NOT notice the kids apparel inside those shops. 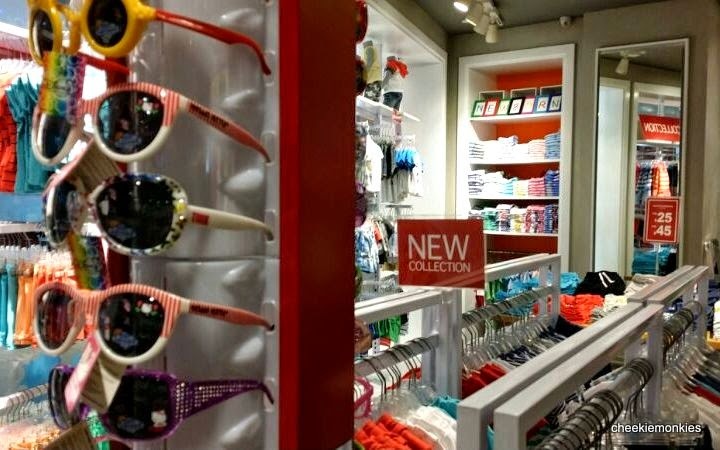 The clothes are vibrant, trendy, full of fun and sometimes super cute too! And can I just say that it is often not just me that is drawn into their store, but the monkies too? 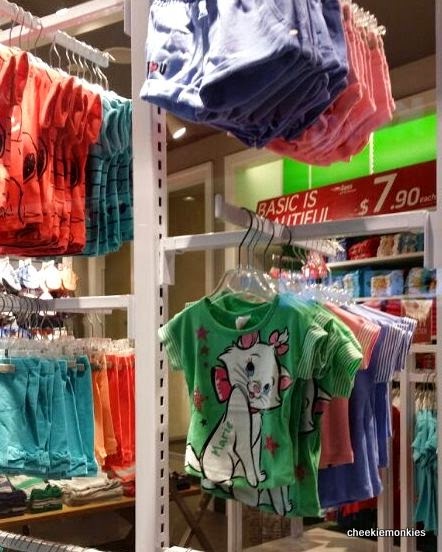 Especially with the brand new Summer 2014 collection in stores right now, all of the clothes looked like the definitive cotton candies clothing edition. 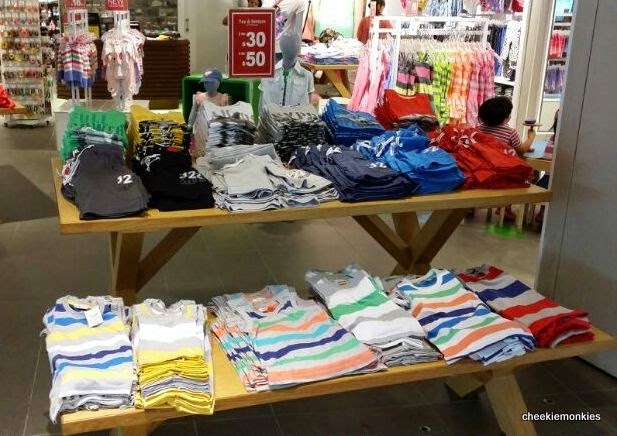 This Summer range is all about bright colours, striped patterns, trendy boys and girls shirts, denim bottoms and lots of irresistibly fashionable dresses! But the one collection that caught me eye was that of the FOX Swimsuits Summer 2014 Collection, with some of the cutest range of swimsuits! You can view most of the range HERE. So needless to say, three sets of swimsuits followed us home. Unsurprisingly, the boys have grown increasingly vocal when it comes to picking their fashion these days. 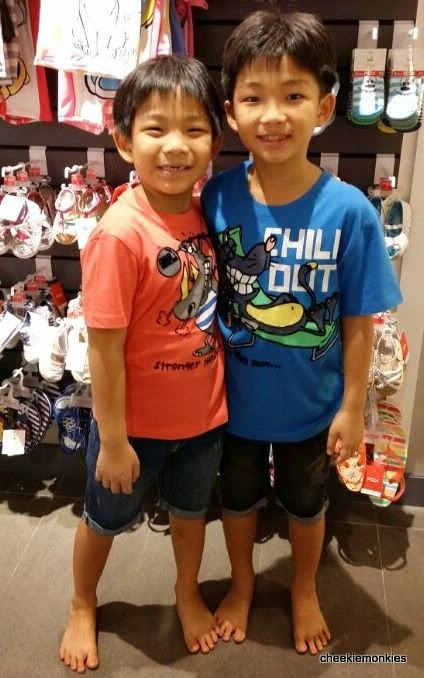 I guess it is a sure sign that they are becoming their own not-so-little people so I gave them a free rein in picking out a few apparel of their choice. The boys settled on the denim shorts because as they put it, "The shorts are so soft and comfy!" As for the tops, they decided to get something sleeveless in the end, and sleeveless tops were what went into the shopping bag in the end. As for the Diva, who's to deny her the freedom of choice too after seeing her 2 older brothers pick out their own clothes? Her resultant decision? This denim dress. A chic and stylish choice, I must say. The thing about FOX Kids & Baby is their style of clothing is so easy to love. Well, that and the fact that they carry clothing which feature cute cartoon characters too... which in turn makes Ale pose like those blogshops models. LOL. All you have to do is to tell me which FOX Kids & Baby apparel catches your eye. Hint: Browse through its catalogue HERE. Leave your comment either in this blog post, or in the corresponding Facebook post HERE. Giveaway ends on 20 July 2014, 2359 hours and is open to residents in Singapore only. Congratulations! You have each won a $50 voucher from FOX Kids & Baby! Kindly email me at kelvin(at)cheekiemonkie.net for your prize collection details. Thanks! To view FOX Kids & Baby latest Summer 2014 collection, visit HERE and HERE. 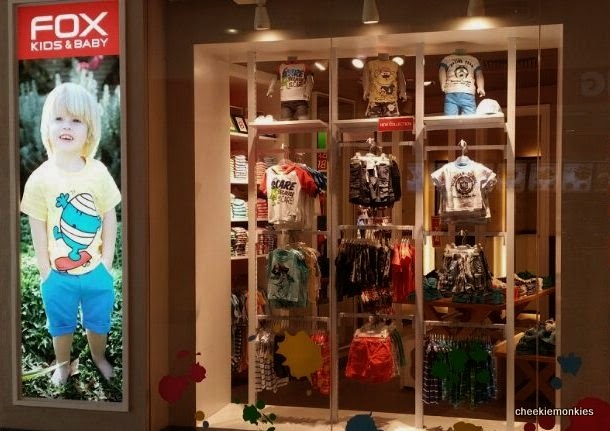 And to keep updated with the latest news and promotions from Fox Kids & Baby, follow them on Facebook (Fox Fashion (Singapore). I like the hello kitty girl T shirt. The maxi dress that comes in purple, pink and white caught my eye! The demin dress Ale is wearing I can imagine my girl wearing it will look cute and pretty. Hey Hey the beach bermudas is so nice! Wonder if my boy can wear, as he really had so little clothes! I love, love the girly spaghetti denim overalls! I love the dont and comfy denim shorts. I love the rainbow stripey dress that's paired with the blue fox jacket. I love the purple,pink and white maxi dress with back lacy design just nice for my 3 girls. As well as the tank tops with the hot denim shorts. Love the wolf that is chilling out! I love the sweet Hello Kitty t-shirt for the girls. We like the girl green top with marie (http://www.foxfashion.sg/catalog/hot_looks/#landscape-338821jpg) and the boy red top with the wacky rabbit (http://www.foxfashion.sg/catalog/kids_baby/#). Reminds me of my sweet girl and cheeky boy ! 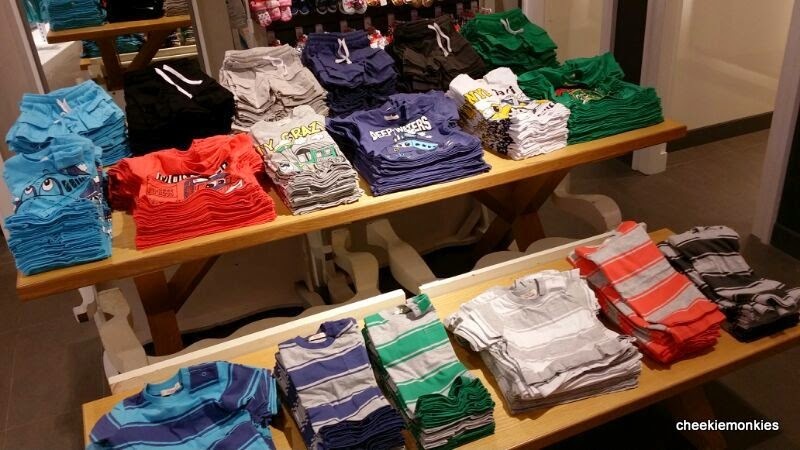 I like the short and long sleeve shirts for boys. Comfy material so wearing them does not get too hot for active boys. Anything with hello kitty on it..and fox doesnt change a premium for licensed character like hello kitty ! I love the demin romper! So in style. 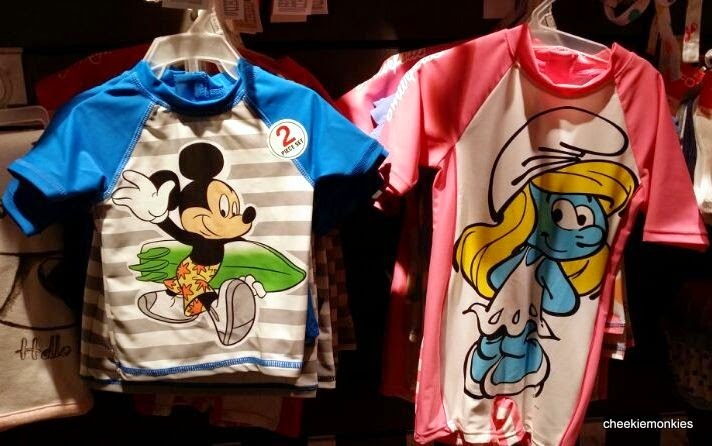 The Smurf swimwear is so cute! I'd love to win the stripey collection. Colourful stripes are always in fashion and so lovely and refreshing to wear. I hope to win some stripey wear for my son. I love the Minnie mouse stripey shirt with the love wordingand the hello kitty tops! Love all this vibrant cool clothes. I like the Hello kitty white t shirt with colour sprays which is very fashionable and casual.It will look good for my daughter. the white polka dots red long tier dress catches my eyes. I love their Hello Kitty series! So sweet on little girls! Super love those Hello Kitty t-shirts and colourful maxi dress...great for my princess who is super "fashionista"